Peter Jaszi speaks to participants at a fair use workshop in Richmond, Virginia, March 24, 2017. 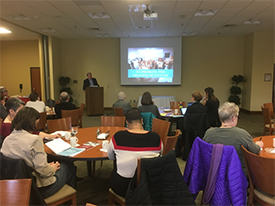 On Friday, March 24, the University of Richmond Museums, Virginia, hosted a CAA Fair Use Workshop, co-sponsored with the Virginia Museum of Fine Arts Statewide Program, and made possible with a grant from the Andrew W. Mellon Foundation. Elizabeth Schlatter, CAA Vice President for the Annual Conference, and Deputy Director and Curator of Exhibitions at the University of Richmond Museums, led the planning effort to bring over 40 artists, museum professionals, archivists, professors, librarians, and communications experts to the daylong workshop. The program was led by Hunter O’Hanian, CAA’s Executive Director, and Peter Jaszi, Professor of Law at American University, and one of the two lead principal investigators on the project. After a round of introductions by attendees, Jaszi began the day with an introduction to the doctrine of fair use, followed by a presentation by O’Hanian about CAA’s four-year fair use initiative and the methodology employed to develop the Code of Best Practices in Fair Use for the Visual Arts. The workshop continued with a focus on fair use in art museums, including when it can be invoked in exhibition projects, publishing, and online activities. During a working lunch, Jaszi and O’Hanian led discussions on reliance on fair use in teaching, publishing, and making art, and concluded the day with a discussion about fair use in libraries and archives. Catherine G. OBrion, the Librarian-Archivist at the Virginia State Law Library, wrote afterwards, “I have a much better understanding of the legal standing of fair use, its intent, and how I can defend relying on it to my in-house counsel and others….One of the most useful workshops I’ve attended.” The workshop was followed by a reception at the University Museums for all CAA members in the local area. CAA executive director O’Hanian also met with two University of Richmond classes the day before, one a museum studies seminar and the other a class on contemporary art and theory. The undergraduates benefited from O’Hanian’s advice on curating exhibitions, organizing public programs, surviving and thriving as a visual artist, and applying for artists’ residency programs.